Improving cycling is not always about building big bridges or developing high tech innovations. Sometimes a missing link in the cycling network can be fixed by the simple removal of just a few car parking spaces. 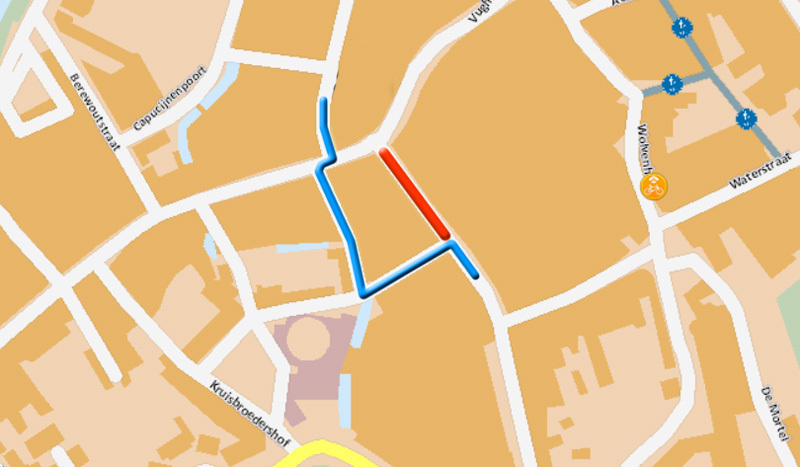 That is exactly what happened in the city centre street in ʼs-Hertogenbosch that I’d like to focus on in this week’s post. The Sint Jorisstraat in ʼs-Hertogenbosch. It is now allowed to cycle in both directions. If you didn’t know any better you’d think the street had always been this way. 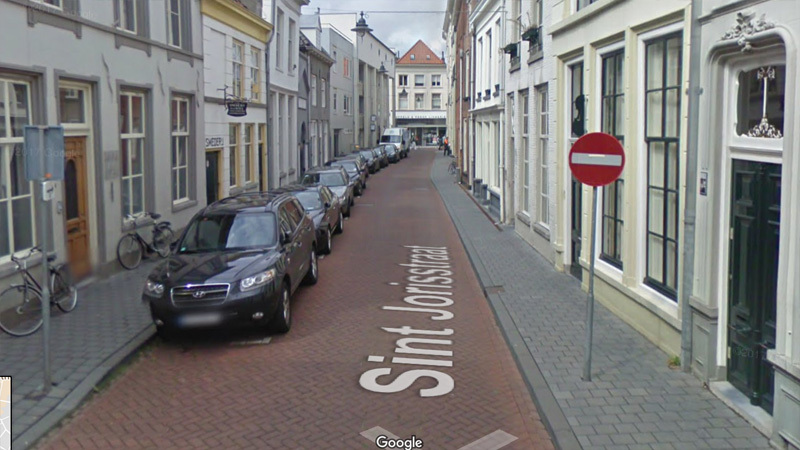 The tiny Sint Jorisstraat (Saint George Street) in ʼs-Hertogenbosch has existed since the middle ages. Its name dates back to a chapel of Saint George that was already there in 1411, the date of the first written record. The street is full of monumental buildings, national and municipal, one of which was a fire watch house, with a pump to pump water from the small river that flows under and behind the houses of the city. Sadly the chapel was sold long after the reformation and its final remains were demolished as recent as 1964. The homes in the street were in a deplorable state in the 1960s. This was the time the city planned a main road in this tiny street and that would have meant that one half of all the buildings would have had to be demolished. A corner home was already removed and left a big gap that was only filled again in the mid-1980s after the plan to build a network of main roads in the historic centre was abandoned like it was in so many Dutch cities at the time. All the houses have since been restored and the street is in a perfect condition now. The street is very narrow and until very recently parking was allowed for permit holders at the beginning of the street. Just 8 parking spots, but that is still a long row of parked cars. They made the street even narrower and also made it impossible to allow cycling in both directions. The street was therefore one-way for all traffic. This made a detour necessary, if you wanted to cycle to the station from the south-east, through two even narrower alleys that didn’t allow motor traffic. After the reconstruction of the main shopping street Vughterstraat one of the alleys ended on the sidewalk of that street, a place where nobody expected to encounter people cycling. 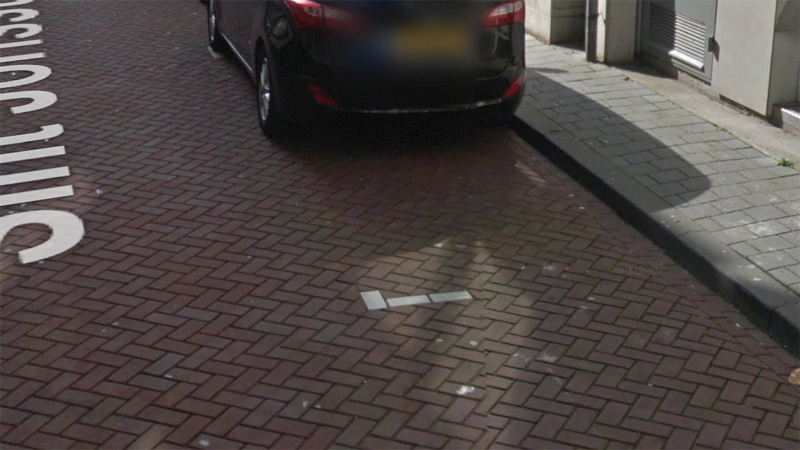 That made this connection very inconvenient and it led to many people riding against traffic in Sint Jorisstraat. To solve the problem of the missing link the city came up with a simple and easy solution. Removing the 8 car parking spaces would make the street wide enough to allow a counter flow for cycling. And this is exactly what happened. 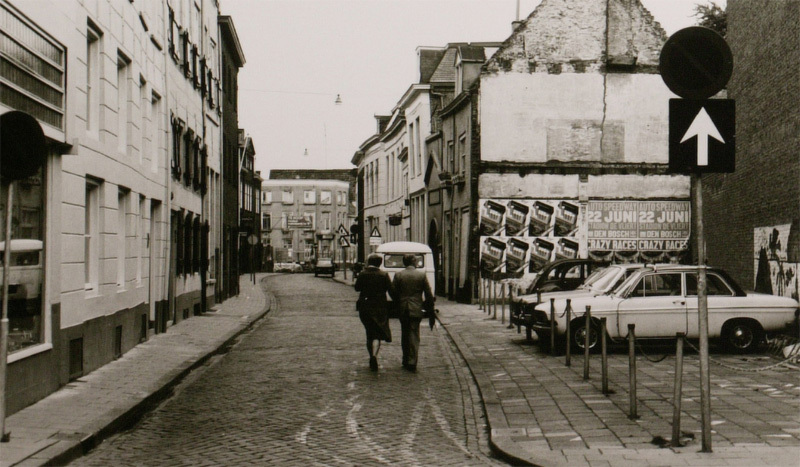 A building on the corner of Sint Jorisstraat was demolished in the 1960s to make room for a wider street. That never came but the gap was only filled again in the mid 1980s. Picture circa 1980 Stadsarchief ʼs-Hertogenbosch. You may think that in a city centre where parking is very scarce there would be loud protests, but only the residents were affected. These 8 places were for permit holders, not for the general public. Because of the legally parked cars, other drivers would park -illegally- behind those cars in a zone that was not wide enough for parking. “Just for a few minutes for a quick errand.” But that happened all day long by a lot of drivers in succession. So, the residents in front of whose doors that took place were quite happy that the street got completely car free. Now drivers are less likely to park their cars where it is not allowed. It does still happen, but not on the same scale. The permit holders were offered parking spaces in two nearby parking garages. The local watch dog group of city centre residents is not too happy about the parking policies in general. There are people complaining they have been on the waiting list for a parking permit for over 5 years. In August 2015, there were almost 400 people on the waiting list. Per household you can apply for one parking permit. The permit gives you the right to use one of the free places in a sector. It doesn’t give you a designated place. That made relocating a number of places (including these 8) easier. The municipality admitted to still have around 200 people on the waiting list late 2015. Meaning one permit had to be terminated before another new one can be issued. City centre parking permits cost €52 per quarter (amounting to €208 per year). The areas away from the city centre are much cheaper, at €40 per year. But you cannot apply for a permit for a nearby residential area. The city only wants local residents to park in their own neighbourhood, not residents from elsewhere. I don’t know what the current status of the waiting list is. But owning a car when you live in the city centre is certainly discouraged this way. However, these people live at walking distance from an intercity station so they have a good alternative to the car. The exit of the alley that served as the detour for cycling before the counterflow was allowed. Absolutely not designed to carry the main flow of cycling. There is a downside to the change. The street now looks a lot wider than it did with parked cars and that causes some drivers to speed. On the other hand: for cycling the street really improved. It is no longer necessary to cycle a detour in a small alley and on the sidewalk. Instead, it is very nice to be able to cycle the most direct route in a counter flow. 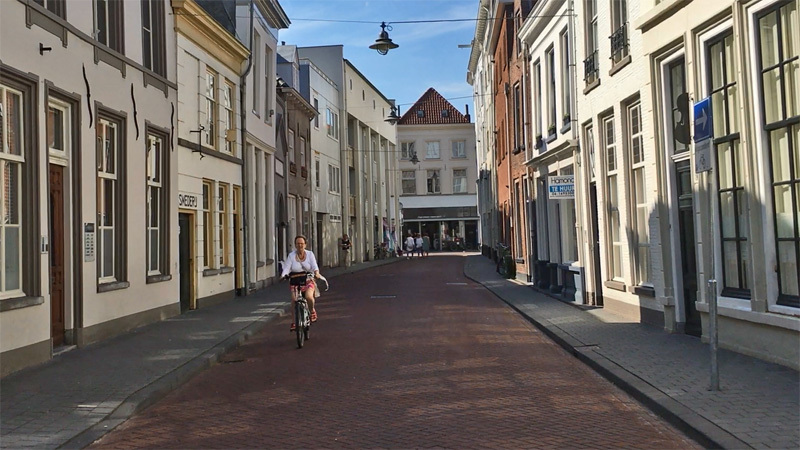 This week’s video shows the new counterflow in the Sint Jorisstraat in ʼs-Hertogenbosch. It looks like you could easily narrow the road with some planters place atop the surface, which would also add some greenery that is missing. Upside is that now they have room to widen the sidewalks. 30cm each side would help if you want people be able to walk alongside someone in a wheelchair. 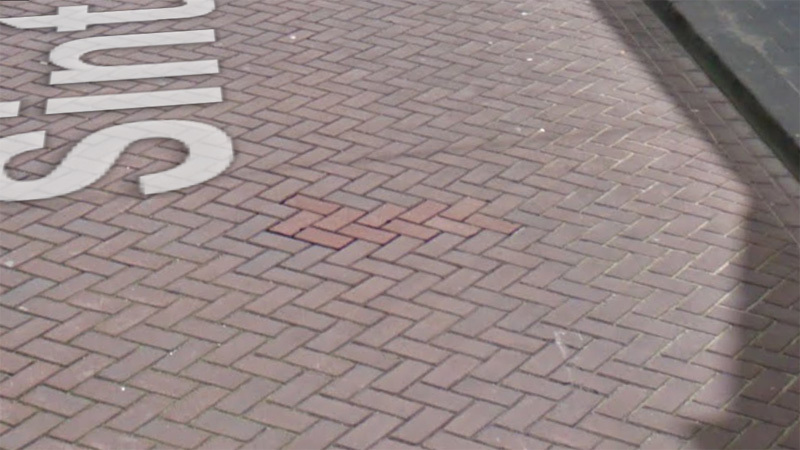 Unfortunately it is very expensive to relocate the kerbs, because the grates for the rainwater drains are incorportated into the kerbs. The street was redone fairly recently (that’s why it still looks so crisp) so I don’t expect it will be redone again any time soon. 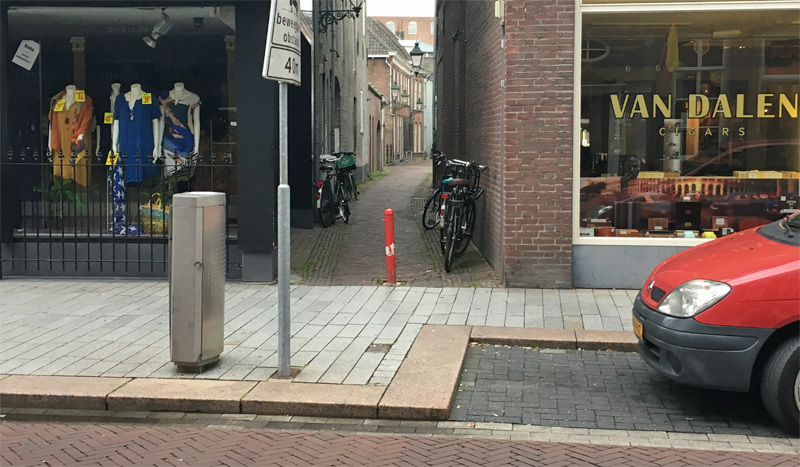 This entry was posted on 29 August 2017 by Bicycle Dutch in Original posts and tagged ’s-Hertogenbosch (Den Bosch), urban design.